Publisher: New York City : Macmillan Co.
Plwlo^riifiii by S. W. Lotlridge THE AMERICAN BARN OWL Order— RaptoresGenus — St fix Family — Stri^idreSpecies — Strix pratincola (185) The American Barn Owl By WILLIAM BUTCHER President National Association of Audubon Societies DESCRIPTION , The upper parts are a yellowish buff overlaid with grayish, and more or less speckledwith white; underparts varying from pure white to ochraceous buff, dotted with black,some individuals profusely and others with but few spots; wings and tail generally lightlybarred with blackish; legs long and feathered almost to base of toes; feet dark; very large,white, heart-shaped facial disk, with narrow black and buff edging, this latter appearingas if burnt or charred; maroon-colored spot between eye and bill, sometimes completelysurrounding the eye; bill yellow; eye black. 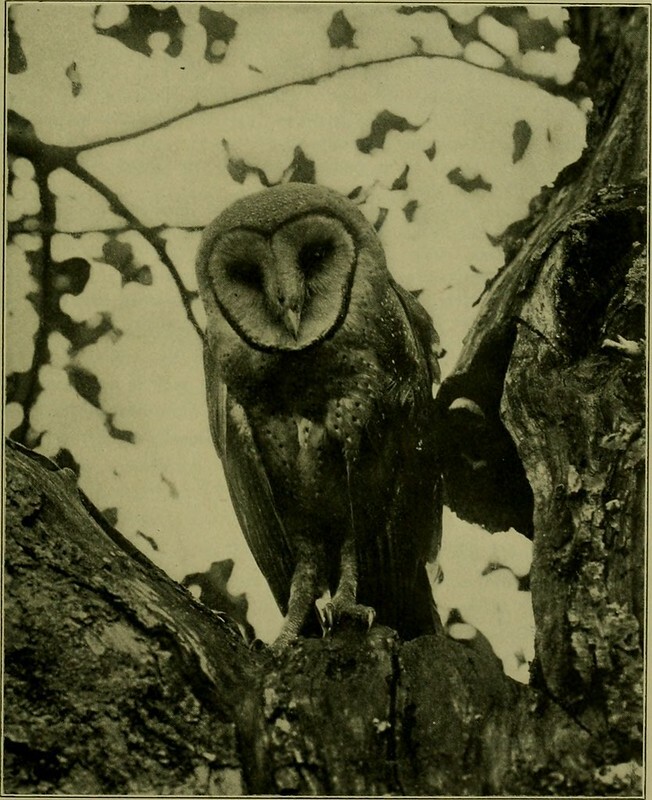 The only other species of Owl with blackeyes is the Barred Owl, which is a much larger and darker bird heavily barred on head,neck and breast. The two cannot be confused. Size. Image published by Internet Archive Book Images on 2014-07-26 15:51:53 and used under Creative Commons license.